A popular search on Google is for the phrase, ‘what is email marketing’. What I would like Google to say when you type that in is, ‘what isn’t email marketing’. In reality, the answer is a lot more complex, and depending on your level of intelligence and expertise in the area, that answer may confuse you a great deal. The point I want to make in this post is that any email sent by a company to a consumer SHOULD fall under the heading of Email Marketing. Many people will groan, ask why, and tell me that I’ve overstepped my bounds. The reason that EVERY SINGLE EMAIL sent by a company to a consumer is email marketing is because they will all help to shape the message. The message is the general impression and totality of information a consumer gets from your company. Let’s look at some types of emails that fall under this heading (some you may not think of as marketing). As you can see, there are a lot of potential emails that your company sends out. And this is only the start. Think about all the emails that go out each and every day. They’re all part of your email marketing plan (or at least they should be). 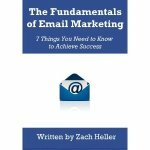 Want more info on email marketing, check out "The Fundamentals of Email Marketing" book.